This research surveyed the economic patterns of the farmers, and the choices they make to make best of the resources they have. Some grow fine cacao, bulk cacao, or both. Some farmers have family members who work off the farm in order to bring in more income. In order for farmers in Ecuador to grow more fine cacao, they require more incentives, such as more value placed on this cacao at the national level. Currently, farmers sell both fine and bulk cacao for the same price. This research looks at ways these farmers may be able to improve their farm income while also growing a higher quality cacao. Right now this isn’t really a viable option. Many makers today boast their hand in improving the lives of cacao farmers worldwide. Some blindly do so, while others understand the limitations they have. It’s important to have evidence for the impact they have, or don’t have, on the people they profess to be helping. As mentioned above, there is a push for more sustainable and fairly traded cacao. However, these terms are misused far too often, and we place a lot of faith in makers and marketers since most of us never see the evidence behind these supposed “fair” relationships. The better we understand them, the better we can discern between makers who are really making a difference, and those riding the coattails of the ones actually doing the work. Cacao Nacional (CN) is considered fine cacao, and grown predominantly in Ecuador. Pure Nacional cacao is very rare, so most CN in Ecuador is a hybrid containing genetic material from another variety. Fine cacao makes up about 5-10% of the total world’s supply of cacao. CCN-51 is a hybrid cacao developed for characteristics to make it more profitable for the farmer, but is considered bulk cacao, not fine flavour cacao. There is a push for farmers in the world to grow more fine flavoured, high quality cacao. However, that can be expensive for them, and so they require incentives. One of those incentives is creating a value chain development (VCD) where they are paid more for their fine cacao with the hopes that they will grow more fine cacao and less bulk cacao. Most farmers groth both bulk and fine cacao together, and so this dilutes the genetics of the fine cacao trees since they may hybridize with local bulk trees. Both CN and CCN-51 are sold at the same price in the Ecuadorian market, so there isn’t much incentive for farmers to grow the fine CN. The farmers make choices based on what works for their farm and their livelihood. Below is a chart of the information provided in this article comparing CN and CCN-51. Chart 1: Summary of CN versus CCN-51. In 2009, the Ecuadorian government partnered with local and international organizations and began the Project on Restoring CN Cultivation (PRCN). Their goals are to protect the fine Cacao Nacional variety, while also forming a value chain development for CN, which would allow poor farmers to sell fine CN for more money. However, there are trade-offs for the poor farmers if they were to grow more fine cacao, and this project has been criticized that it doesn’t address these trade-offs. This study by Diaz-Montenegro et al. analyzes these trade offs. Many misinformed consumers encourage others to avoid chocolate made with CCN-51, in order to encourage the growth of a more favorable, high quality cacao. However, farmers need to make a living in their already economically and politically volatile world. Their priorities don’t include what cacao a chocolate connoisseur prefers. These same consumers also encourage others to purchase higher priced chocolate. According to them, a higher priced chocolate bar indicates the farmers were paid more for their hard work, and that it encourages the growth of fine cacao. As you can see above, in Ecuador, which is the largest supplier of fine cacao in the world according to this paper, farmers get paid the same regardless of the type of cacao they grow. This cycling of misinformation, even if the idea behind it is genuine, can lead to an educational blind spot and hinder any progress for those they proclaim to want to help. It’s important to look at the numbers in this research article and see for yourself what would be some potential solutions to encouraging the growth of fine cacao while also improving the farmers livelihood. The more you spend on chocolate the better! Better what? Better flavour? Better for the farmers? The marketing of fine bean to bar chocolate pushes the idea that paying more for chocolate somehow benefits the farmers involved. Chocolate makers pay premium prices for fine cacao, but are the farmers direct recipients of this extra cash flow? It depends if they sell to their national market, for which they get paid the same price regardless of the quality of their cacao, or if they sell directly to a chocolate maker who would likely pay them a premium for higher quality cacao. The researchers surveyed 9 rural sites in The Guayas, Ecuador: Lorenzo de Garaicoa and Yaguachi Viejo (representing 10% of the Guayas cacao production). They interviewed 188 heads of households randomly selected in these regions to partake in a 45 minute interview. Table 1 below summarizes this information. Here the family run farm revolved predominantly around farming cacao. Most of their labour comes from family members working on the farm. Here the family run farm is focused on agriculture, but utilize both family and non-family labour. CCN-51 (bulk cacao) made up most of the cacao grown. These family run farms had their income coming from both family labour on-farm, and family labour off-farm. In regards to cacao, they grew predominantly fine Cacao Nacional. These farms were often medium to large scale, and they utilized on-farm family labour, off-farm family labour, as well as hired workforce. They also grew mostly fine Cacao Nacional. Table 4 below summarizes all the data from each of the four profiles. I have included a graph I created to visualize the labour types and cacao type statistics for each of the 4 profiles. Graph 1: I created this to reflect the first 5 statistics from Table 4 above, which focus on labour and cacao type. You can quickly see here that farmer which rely predominantly on agriculture as their source of income prefer to grow more bulk CCN-51 cacao. Farms from profile 3 and 4, which are financially more stable appear to be able to grow fine Cacao Nacional. Table 6 (above) offers more information about the type of on and off-farm labour the farmers and their family partake in. Table 5 (below) summarizes more detailed statistical information on the farmers land, education, and capital. Now that you’ve had a chance to look over the statistics, let’s summarize the observations of the four different profiles analyzed. You can refer to the Graph 1 above to get a better visualization of the 4 profiles. Doing so will help us get an idea of the challenges and/or advantages the different types of households face. You will see that one cacao farmer in Ecuador can have a very different livelihood from their neighbours. This profile accounts for most of the farms surveyed. The strategy of these households is to utilize a large portion of family labour for agricultural practises (M = 0.79). These farms utilize about half of their land to growing cacao, and this land is fairly evenly distributed between fine CN and bulk CCN-51. Of all the profiles, these farms devote the most land to growing bulk CCN-51. The labour consists of predominantly on-farm family labour. The researchers hypothesized that because CCN-51 is less labour intensive than fine CN, the farm is able to rely solely on family labour, and do not need to bring in non-family workers. It appears that switching to fine CN wouldn’t be a economically favourable decision for them. This is a typical profile of a farm that focuses mostly on growing cacao, and not so much on growing other produce or off-farm activities. These farms devote two thirds of their land to growing cacao, but grow almost twice as much CN as they do CCN-51, very different from farms in profile 1. 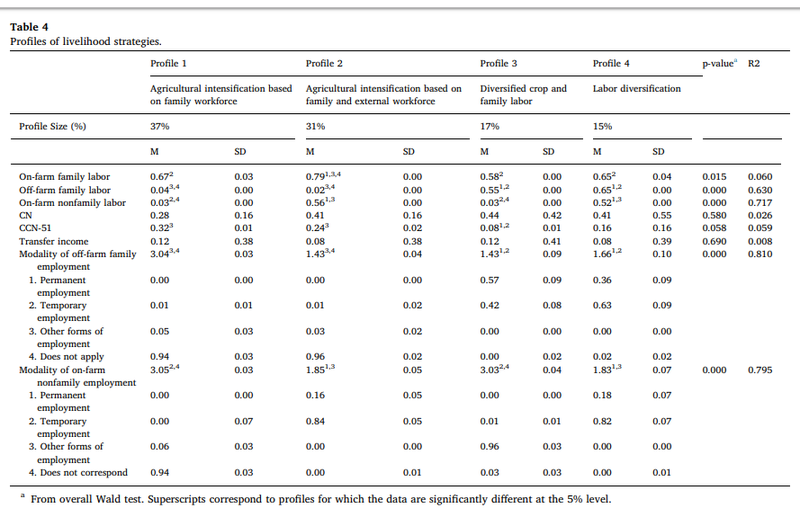 They also utilize the most family labour devoted to agriculture (M = 0.79), and make use of non-family hired workers as well to help with the farm (M = 0.56). These households were also found to more often than not to belong to farmer associations. These households are also the most vulnerable, with low capital, small land, and financial debts. Therefore, belonging to these farmer associations may be a stragegy to reduce this vulnerability. These farms grow a diverse array of crops, and are sustained by diverse family incomes on-farm and off-farm. These farms allocated the most of their land to growing fine CN, as well as had the most diverse crop production, with 50% of agriculture devoted to other non-cacao crops. As seen in Chart 1 at the beginning of this summary, CN requires shade, and is best grown with other species of taller trees to create the shade necessary. This is termed polyculture agroforestry, which is generally agreed to be the most environmentally stable type of farming. As far as labour goes, their on-farm family labour is as important as off-farm labour, which likely generated income from business-like activities. These households were more likely to have a larger family size with a primary education. The households in this profile had a greater proportion of medium and large sized farms. These farmers also specialize in growing fine CN, but rely on off-farm and on-farm family labour, as well as a good proportion of non-family hired workers. This is why it was coined the “labour diversification” profile. The researchers suggest that this emphasis on external workforce demonstrates they are more business-oriented than agriculturally focused. These households also have higher capital and low debt compared to the other profiles, making them more financially stable, and likely more able to adapt to shifts in the market (such as growing more fine CN). The PRCN is a national policy developed in 2009 in order to encourage farmers in Ecuador to grow more fine Cacao Nacional, and less bulk CCN-51. If value chain development strategies are put in place for fine cacao, then farmers may be able to sell their fine cacao at a higher price. Prior to 2005, third party exporters did not separate fine CN from CCN-51 cacao when being sold to the international market. Some exporters mixed bulk cacao with the fine cacao, and sold it on the international market as fine cacao and at a higher price. Due to this, the International Cacao Organization (ICCO) downgraded fine Ecuadorian in 1994 from 100% to 75%. Although there are now national guidelines for separating fine and bulk cacao, there is a lack of effort by many to follow them since there is no value added to growing fine cacao at the national level. Although fine cacao may be sold for more on the international market, the farmers do not benefit from it directly, and many see no good economical reason to grow fine cacao. Of the households who focused more on agriculture (Profiles 1 and 2), which was two thirds of the households surveyed, CCN-51 was the preferred cacao type to grow. It’s interesting that these are the households which the PRCN thought would benefit from their efforts. Profiles 1 and 2 that focus on agriculture also have less assets and no real incentives to grow CN, so stick to the higher productivity of CCN-51. This is in contrast to profiles 3 and 4 which which have better asset endowments. This endowment and wise use of the assets allows them to respond to shocks, adverse trends, and seasonality. These farms that favour growing CN have a diverse livelihood strategy, which the PRCN should consider as an indirect way to achieve greater CN cultivation. However, these are the same farms that do not focus on agriculture, so although they may grow more CN, they don’t account for the majority of farms and so their impact is suggested to be much slower. The researchers here suggest that there is a mismatch between which farms the PRCN wants to benefit from their efforts (Profile 1 and 2 farmers), and who (Profiles 3 and 4) are actually able to respond to their efforts. They suggest policies formed by PRCN should be focused on “enhancing access to quality asset endowments and providing asset protection for small farmers.” Essentially, encouraging farmers from Profile 1 and 2 to strategize in ways that farmers in Profile 3 and 4 do, which includes a more diverse income and off-farm employment. However, they will need assistance and guidance to be able to follow through with these strategies. Older PostCacao type impacts fermentation, which impacts chocolate quality.